Productive Mama Bottom Line: GET IT! It will save you so much time in the kitchen. I love mine and it definitely makes me more productive. This post has been in my drafts for quite awhile. I love this appliance, but felt like everyone had already written so much about it, I wouldn’t have much new to contribute. But as I saw with the holiday sales and new Instant Pot purchases, folk still have lots of questions and I still have lots to say about this wonderful kitchen angel. First, I do have and Instant Pot, but am speaking about electric pressure cookers in general. So if you don’t have the IP brand, you’re still fine. Second, if you have a large family, you might need one larger than the 6 quart size. OR you need to learn to stack your food in the pot so you can cook more. Basically, try using stackable steamers or stack glass dishes. Or just stack your food up. I pile up potatoes to make a bunch at once and I’ve heard tell you can hard boil up to 18 eggs at once! Stacking also allows you to make more than one dish at once without the food mixing. Third, it does not make a big roast in half an hour. The half hour cooking time they list is how long the roast takes to cook once it gets up to pressure. And it might take 20 minutes to get up to pressure. And then the pressure must release. Many recipes call for a “natural” release, meaning you leave it alone. Quick release is when you put a towel over the IP and release the pressure valve, along with tons of steam, a lot of noise and the delicious smell of dinner. So your half hour roast is probably more like an hour long roast. Still, it’s done perfectly with no oversight. Fourth – it’s stainless steel! Yay! No worries about lead or teflon! OK, now here are the ways I regularly use my IP. as a slow cooker. Sometimes I still need my big ‘ol crockpot, but the IP usually does fine as a slow cooker. It DOES cook high, though, in the Normal setting. And I find the Low too low. So I just plan on following the HIGH times in a recipe. for hard cooked eggs. They come out perfectly. PERFECTLY, I tell ya! I do about five minutes of cook time, then let them sit for five before doing a quick release. Then I dunk them in cold water. Even fresh eggs peel easily. Beans. I soak them for 12-24 hours and then they cook up rather quickly in the IP. I used to cook them in the crockpot all day and still do if the IP is busy. Here’s my post on kicking the canned bean habit. yogurt. I boil the milk in the IP, as it needs no attention. Then I let the milk temperature come down and either use IP to hold the milk at the right temperature for eight hours OR I transfer it to my yogurt maker. ‘Cause sometimes I can’t spare the IP for eight hours! morning grains. I like to soak my grains at least overnight before cooking. The IP lets me soak them AND set them to cook all at once so that they are READY when we wake up. Always remember to add time to build pressure and time for pressure to release. The IP will hold them a nice warm temperature so they’re ready whenever your household gets moving in the morning. Oh, I do the Pot in Pot (PIP) method for grains. With this method you add water to your IP, use the trivet and set a bowl with the grains and cooking liquid on top of the trivet. rice. I’m half Chinese and prefer rice in a rice cooker. I love me some white rice, but I also eat basmati (white or brown), short grain brown, and more. I have been so pleasantly surprised by how well rice turns out in the IP. I also use PIP for rice. keeping things warm. Some days of the week we are out all morning and get home STARVING. If I’m on my game, I’ll put in leftovers and hit keep warm so we can eat as soon as we return. I do this quite a bit. 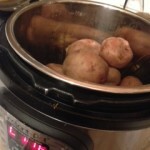 After a few years, your IP won’t gleam as much, but it’ll still cook potatoes like a champ! too lazy. I just toss them on the trivet, add water to the pot and set for about 20 minutes. Now you’re ready for a baked potato bar! broth. I set it for 1.5-2 hours of pressurized cooking and that’s it. I try to do it in the evening so I can turn off the heat before bed and let it cool and come down from pressure overnight. OK, I was worried I might have missed some of the ways I use the IP. So I just asked The Captain, “Babe, if I were to ask you how I use the IP, what would you say?” He answered: “Constantly.” It has a permanent place on my counter top. Thanks to my sister who got it for me for Christmas two years ago, creating a monster. OH, I am so excited because I just found this recipe for congee/jook in the IP! If it turns out, I might have to do a whole post on it. I wish I could SHOW you how to use your pressure cooker! But, alas, I cannot. Good thing there’s this awesome course that’s only $12 (as of this writing) to get you started, should be a bit nervous still! Check out the course outline to see if it might be for you. Previous Post:Productivity Pack – get it NOW!